When one thinks of salads and their dressings, ginger is not an ingredient that immediately springs to mind. Yet it can be a great addition to the recipe and produce a taste bud sensation that can transform a salad. First take a bowl and mix together the garlic, soy sauce, lemon juice, honey, ginger, mustard and pepper. Once these have been mixed well together you may gently add the oil, continuing to mix the ingredients as you do so. Once this has been completed place the dressing in the fridge until you are ready to serve. 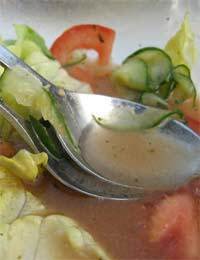 To make the Oriental cucumber salad, first mix the sesame oil, ginger, pepper, salt, vinegar and sugar together. Next take the sesame seeds, cucumber and spring onions and add to the mixture. After this you should set the mixed ingredients to one side,for approximately 40 minutes, giving the flavours an opportunity to develop and allowing you to cook the fish cakes. Place the salad on a serving plate before adding the fish cake and pouring the salad dressing around the edges of the plate. First take a bowl and mix the ginger, rice vinegar, carrot, sesame oil and lime juice together. Next take another bowl, containing the salad leaves and mango, and mix with the ingredients from the first bowl, ensuring that everything is well coated. Once this has been done you may add sesame seeds to the mixture and serve. To make a mesclun and mango salad should take approximately half an hour.